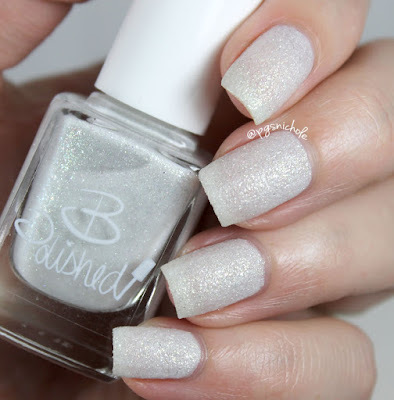 B Polished is becoming a new favorite, and it isn't just because I love and adore Miss Francine. When a collection is made with love, you can feel it. You can see and feel the attention to detail in her initial collection, and her newest offering is no different. Bling In The New Year is a soft gold holobomb. 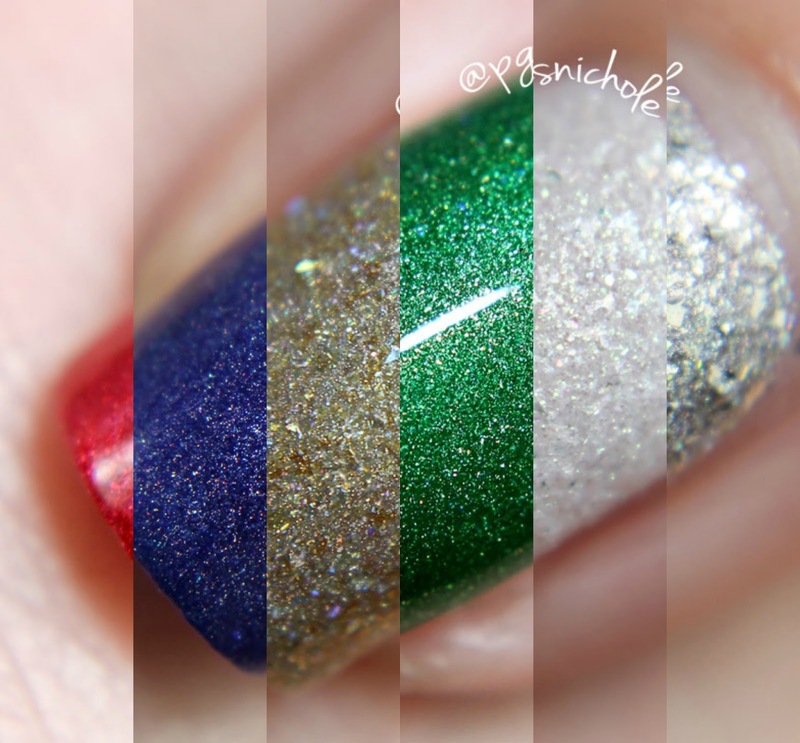 It has pale gold glitters and flakes swimming around in a silvery super holo base. It dries slightly textured and opaque at two coats, though I used a light layer of Seche Vite below. This is a cheerfully warm holly green with a soft scattering of holo over a lightly metallic base. It flowed easily onto my nail and was opaque in two coats. 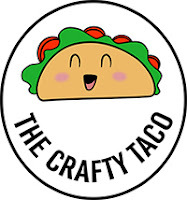 My pal Traci says it stamps well, to boot! 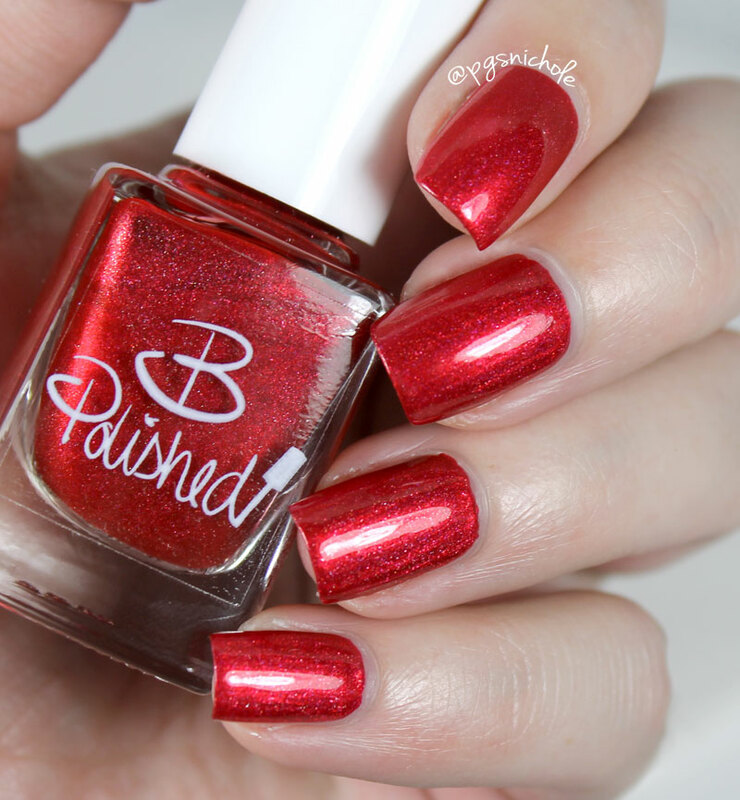 This is the perfect red for the holiday season. 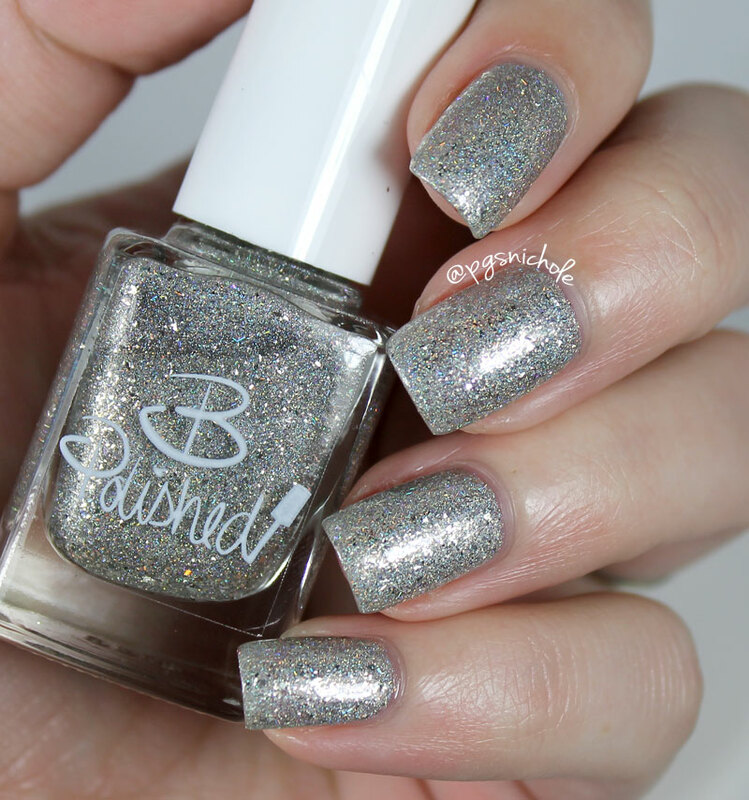 It is a gentle scattered holo on top of a satin-ribbon metallic base. This is also a one-coater, and I can only imagine how amazingly it stamps. December Baby is a perfect denimy-tanzanite blue. It has a solid holo flare over a satiny base...but the best part is also the sneakiest! There is the most subtle, unusual, fascinating pink shift! I had the damnedest time catching it, and only managed to grab it at an extreme angle in my kitchen window...the lengths I go for you people. I used two thin coats + SV for these pictures and I was super happy with the result. 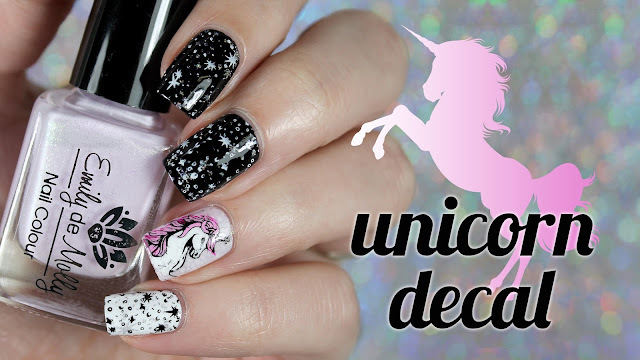 What would happen if you crushed unicorn bones and a disco ball and then painted it onto your fingers? If you want to find out, just keep scrolling. There is an amazing pile of silvery nonsense that I can't even describe. I wish the sun had been out so that I could show you the rainbow. So...I like a white polish. A white, textured polish. I know. But I love it. The texture is really light, and the polish is like snow on a moonlit night (I've seen pictures). I used two normal coats, but I think I'd like another the next go round. But yeah...a good, non streaky, non aggravating white. Who knew? This is the second collection from B Polished, and I am completely impressed so far. It is hard to do holidays without going full on cheese and tinsel...and she managed to get tinsel in there without drowning us in kitsch. Which one is your favorite? :D I saw pictures of snow...once.